A very easy to shoot, cheap target round for any 12 gauge, that allows you to shoot all day without the excess recoil or the dent in your pocketbook. 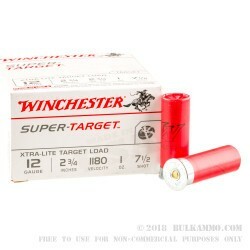 The lite velocity, recoil and pellet weight makes the Super-Target Xtra-Lite Target Load a great all-purpose round when ballistics aren’t your primary concern. The savings in money and in sore shoulders can be quite profound if you use this ammo when you are in need of anything that isn’t top tier. Don’t mistake that commentary for the idea that the production quality is less than stellar. 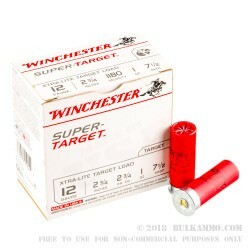 Winchester makes exceptional shotshells, even when they are the cheapest on the market. 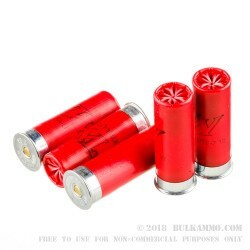 The particulars of this load pushes it distinctly into the corner of shooting that relegates it into a very specific niche, but we often times underestimate the use cases of our ammunition. 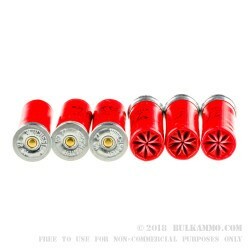 This load is a fantastic shell for use in all 12 gauges for myriad purposes, including small game hunting and target shooting among others. For more reliable use in very hard sprung gas systems (as this is a light loading) in semi-auto shotguns, adjust the gas ports or add a bit of lube in key bearing areas on the piston (do not lubricate the cartridges or magazine tube). Q: Are these steel shot? A: Hello! This Winchester ammunition is a standard lead target shot.